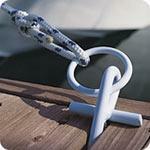 Finally, a dock cleat you can take with you. Easy to store and easier to use, this strong powder coated Cleat with rope ring fits neatly in between dock timbers and twists 90 degrees to lock into place. Now you can position your lines exactly where you want, to best protect your boat without concern for where existing dock cleats may be located. Keep several aboard at all times. The dimensions are: 10in. x 7in. x .5in. Dock Edge 2606WF Dock Cleat Flip Up Ring 6" White | Dock Edge 2608WF Dock Cleat Flip Up Ring 8" White | Dock Edge 2308F Dock Cleat Open Base 6" Aluminum | Dock Edge 2308F Dock Cleat Open Base 8" Aluminum | Dock Edge 2603WF Dock Cleat Flip Up Ring 3" White | Dock Edge 2410F Dock Cleat Open Base 10 1/2" Aluminum | Dock Edge 2308F Dock Cleat Open Base 8" HDPE Black | Dock Edge 2413F Dock Cleat "S" 13" Aluminum | Dock Edge 2810F Dock Cleat 10" Galvanized | Dock Edge 2806F Dock Cleat 6" Galvinized | Dock Edge 2808F Dock Cleat 8" Galvanized | Dock Edge 2508PF Dock Cleat Classic 8 1/2" Polished | Dock Edge 2608PF Dock Cleat Flip Up 8" Aluminum Polished | Dock Edge 2603PF Dock Cleat Flip Up 3" Aluminum Polished | Dock Edge 2409F Dock Cleat "S" 9" Aluminum | Dock Edge 2606PF Dock Cleat Flip Up 6" Aluminum Polished | Dock Edge 2705WF InstaCleat Classic 5" White | Dock Edge 91107F PortaCleat White | Dock Edge 2306F Dock Cleat Open Base 6" HDPE Black | Dock Edge 2804F Cast iron Cleat - 4"